Good Stuff NW: Want Chinese? Just say, "Ommmmmmmm..."
Growing up in Redmond, Oregon, there weren't a lot of choices when it came to eating out. There were the A&W and Pedersons's for hamburgers and The Brand steakhouse for those rare special occasions. The lone outpost of anything resembling ethnic cuisine was a little Chinese cafe downtown called Johnny's, whose owner had been turned down by every bank in town for a loan because no one would do business with a "foreigner" (though I'm sure there were other less kindly terms used). My father, who had just started a community bank in town, saw an opportunity to help a promising young businessman get started and they struck up a friendship. So whenever my parents trooped in with their three kids, Johnny never failed to come to the table to welcome us. Though my brothers always ordered hamburgers and fries, I loved everything from the flashing neon pagoda on the front of the building to the menu that featured egg foo young, chow mein and fried rice, along with canned bamboo shoots and crispy noodles. The flavors were exotic and so different from anything we had at home, and it gave me my first taste of another culture. 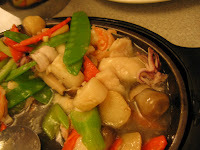 I still crave Chinese food on occasion, so when my brother (whose palate has expanded greatly since his hamburgers-only days) blogged about a place called Om Seafood and said that his father-in-law-to-be had given it the Chan family seal of approval, I knew I had to go there. So with our neighbors graciously agreeing to accompany us on the foray, we ventured over to SE Powell to see if it was all that. Compared to the upscale dinnerhouse decor of Wong's King, Om Seafood is definitely on the more casual side, but the food is rightfully what brings folks there. 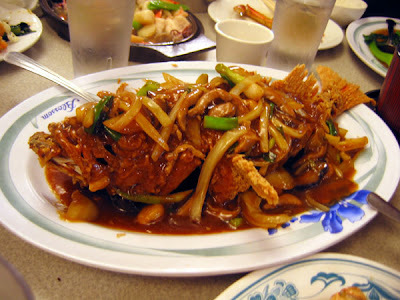 Our whole braised fish (top) was actually fried and then covered with vegetables that had been simmered in a sauce of star anise. And, just fyi, the crunchy, crackly fins are meant to be eaten as much as the tender flesh. We also ordered the salt and pepper shrimp (above left), and when SEH asked to have them with the shells on, our waitress looked at her like she'd just grown horns. Apparently Anglo customers don't often request them that way, but after much convincing on our part, the shrimp were brought out. They'd been deep fried, and we were instructed to eat them whole, head, shells and all. Biting down, the shells shattered and the shrimpy goodness exploded in our mouths. Who knew? The seafood medley was good, too, and the whole crab covered in sauce, while messy, was unbelievably fantastic. 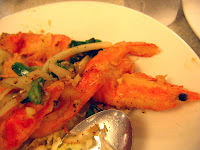 I can't wait to have those shrimp again. And I hear their noodles and hot pots can't be beat. Then there are the sizzling rice dishes and, well, I guess we'll just have to go back. See you there! Details: Om Seafood Restaurant, 7632 SE Powell Blvd. Phone 503-788-3128. Oh yeah. Redmond when we were young.... It's changing. We may need to do a field trip. I was there a few years ago and was shocked at how big it is, but also surprised there were as many of the old landmarks that I remember. It would be a fun trip! are you sure it was called Johnny's and not Stockton's? You know, actually, I'm not. I asked my mother and she remembered that they always called it Johnny's. But it could have been something else. Anyone else know?